Sciatica is the term used when the sciatic nerve is irritated. The sciatic nerve is the largest single nerve of the body and is composed of individual nerve roots that start by branching out from the spine in the lower back and combining to form the “sciatic nerve”. The sciatic nerve runs from the low back, down the back of both legs. This nerve innervates certain parts of the leg (Eg. the buttock, thigh, calf, foot, toes). The term “sciatica” is not a medical diagnosis – it is the symptom of an underlying medical condition used to describe symptoms of leg pain and sometimes tingling, numbness or weakness that originates in the low back and travels through the buttock and down the large sciatic nerve of the back of the leg. Typically, symptoms are only on one side of the body. Sciatic pain can vary dramatically from intermittent and infrequent to constant and incapacitating. The symptoms can also vary dramatically in type, location and severity. This can be determined from an underlying condition causing the sciatica (such as a herniated disc or disc bulge). 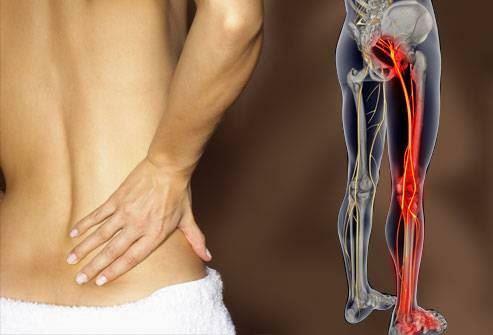 Sciatica symptoms can also differ depending on where the nerve is pinched. For example: a nerve impingement at L5 (the lowest low back segment) can cause weakness in extension of the big toe and potentially in the ankle. Management can vary and symptoms can resolve over weeks to months. It is important that treatment in the first 6-8 weeks is conservative. Your physiotherapist will work with you and advise the best form of treatment for your stage of presentation. This can involve hands on treatment, hydrotherapy, a home exercise program and then progressing to a strengthening program including Pilates and gym work.